Josh Gu will be at UC Irvine this fall to earn a Ph.D. Attending the UC Davis Pre-Health Conference as a high school junior, Josh Gu grew fascinated with biomedical tools that are helping scientists understand and address the world's most difficult diseases. Gu also heard a name that stuck with him: David Haussler. As Gu looked toward college, UC Santa Cruz became a prime destination, given the possibility he could someday work with Haussler, a professor who led the team that in 2000 posted the first publicly available assembly of the human genome sequence online. Gu toured UC Santa Cruz after getting accepted and arrived in fall 2014 to pursue a degree in bioengineering with a biomolecular concentration. He is this year’s winner of the Steck Family Award, which honors the best senior thesis completed during the academic year, with the winner chosen from the Chancellor's Award candidates. Loren Steck (Porter '73) was part of the selection committee that chose to recognize Gu's project. The Steck family created the endowment that funds the award. 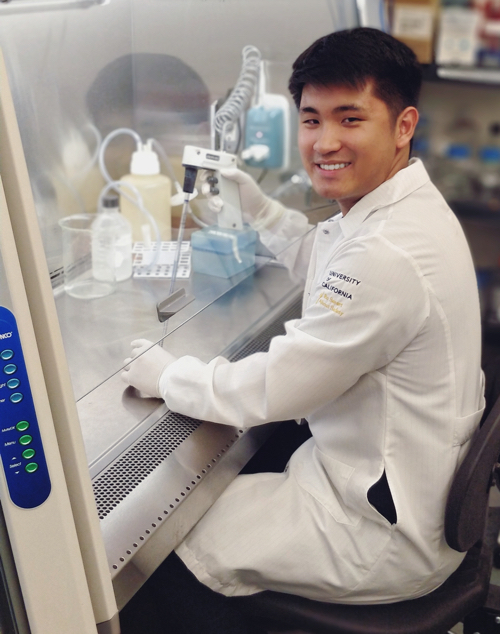 After his first year, Gu decided to reach out to Haussler to see if he could join his lab. He wasn't sure what to expect. "I heard some professors don't always reply to their email," he said. Haussler did, putting Gu in touch with Sofie Salama, who brought Gu into the Haussler Wet Lab, where he worked from his sophomore to senior year studying gene regulation in human development. "I was very honored to be in his lab," Gu said. "I knew how important this lab was." Gu worked closely with postdoctoral scholar Jason Dionisio Fernandes and lab manager Kristof Tigyi as he learned more about KRAB zinc finger genes. “I didn’t know that much about (KRAB zinc fingers) when I joined the lab,” he noted. Gu notes that working with stem cells and CRISPR were opportunities only found in a lab environment. Fernandes said Gu was one of the most dedicated students he’s ever met. “Josh was always willing to take criticism and suggestions and work to make himself a better scientist,” Fernandes said. “He made important contributions to a project that studies how genetic elements within the human genome have been battling one another and how these battles have shaped the course of human evolution. Gu, with College 10, graduated in winter 2018 and is set to participate in this weekend's commencement exercises. This fall, he will be at UC Irvine, where he'll be in the cellular and molecular biosciences program to earn a Ph.D. He credits UC Santa Cruz and its supportive community with preparing him for this next step. "I had some great mentors—the best in my life," Gu said. "They are people who helped me and supported me."